What’s not to love in a meal that combines grilling over an open fire, wholesome (and budget friendly) cooking-from-scratch ingredients, easy no fuss meal preparation, relaxation out in the fresh air and the tantalizing aroma of sizzling foods dripping with juices? When I was growing up, cooking out in our well-shaded back yard was always a treat. It was the only time my father ever had anything to do with food except eating it and carving roasts. Yet like most men since good old cave-man days, he was a natural at the fire. Give a man some hot dogs and hamburgers, toss in some charcoal and he was somehow able to grill them to perfection. In the northeast, this is now the primo time of summer when local tomatoes and corn are about to make their star appearances in food markets. Add them to these grilling recipes selected from five super sources and you’re in for some delicious barbecue bashes. 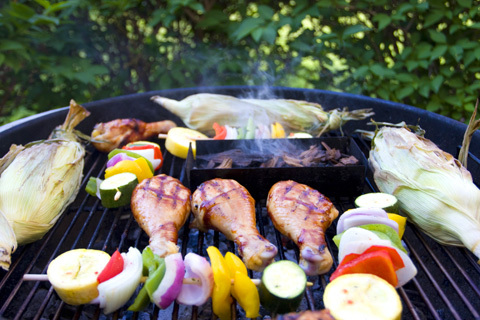 Mark Bittman, New York Times, shares his 101 fast recipes for grilling. And when he says fast, he’s not kidding. His ideas highlight off-the-beaten-track flavor combinations like mango with white fish and ground beef with blue cheese, walnuts and grilled pear. He seems to grill just about everything. Coleslaw, tuna niçoise, angel food cake, fruit salad and watermelon are fair game when he’s holding the barbecue tongs. So live on the wild side and slap that hunk of melon on the grill. The Food Network features recipes and grilling tips from the Neelys, the super-charged king and queen of barbecue, along with BBQ recipes from the network’s numerous chefs. Salads, sides and general grilling guides are also covered. The recipes range from all-American hot dogs and hamburgers to audience favorites to “low and slow” tasty barbecue meals. Feeling left out with no backyard grill? Try Bobby Flay’s honey-mustard glazed ribs cooked in your oven. Delish.com presents 28 succulent skewer recipes for the grill. Inspired by classic and international kabobs, these versatile meals-on-a-stick, paired with complimentary side dish recipes are perfect for al fresco dining. Food.com showcases a vast library of over 6,000 barbecue recipes submitted by foodies from all around the globe. Created everywhere from Mom’s kitchen to glossy international publications, the inventive recipes for grilled foods are juiced up with plenty of details and personal opinions. Featuring the recipe’s preparation and cooking time is a nice touch that will be especially appreciated by busy cooks on the go.